Perfect Retreat for Family&Friends Reunions! Overlook town from the Mtn side! A Jane's Lodges Popular Vacation Home! The Ideal Spot for your Reunions and Large Group Vacation! Denver families! : Split this rental with your friends!! Seasonal and Monthly Rentals Available! 2019-2020 Season calendar is open. 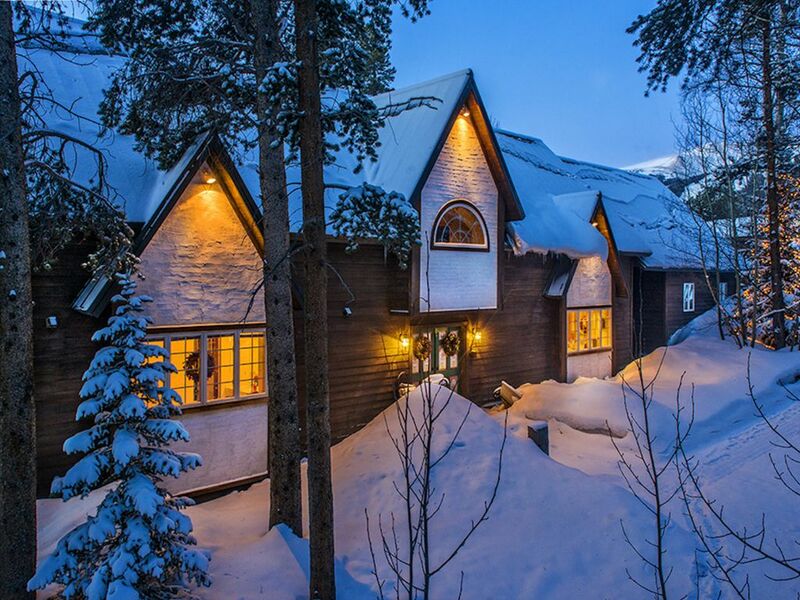 If you have been to Breckenridge... you have seen this home; perched right above town with the most perfect views of the twinkling lights of Breckenridge. The Ski Hill Lodge has hosted Wedding Guests, Corporate Meetings, World Cup Skiers, Family Reunions,Pro Cyclists, Outings.... Denver weekend warriors have reserved this lodge seasonally and monthly. Great vacation home layout. Full of amenities. 65 foot long deck! Just 1 1/2 blocks to the ski shuttle (under a 5 minute walk); and right on the bike/pedestrian path. The perfect lodge for a large group of people! This home used to operate as a European catered chalet... Now available for private rentals!!! Private Chef; Kelly Brenholt, available at this home! This is 1 of our 5 Private Homes; Please visit our website to find the perfect property that will fit your vacation needs. Born and raised in the Pittsburgh Area of Pennsylvania; I moved to Breckenridge, Colorado to start 'Jane's Lodges' with my Dad. Jane's Lodges has been operating in Breckenridge for 28 years! We purchased this House in 1995; and update the lodge annually. Jane Hamilton is the Owner of The Ski Hill Lodge and Jane's Lodges in Breckenridge, Colorado. When this property was purchased; it was being operated as a Ski Chalet catering to European Ski Travelers. The "chalet" was completely catered and hosted groups over the entire 6 month Season. We continued to operate The Ski Hill Lodge in this manner for many years with Ski The World. When we starting getting heavy interest right here at home; we opened the lodge to operate as a private vacation home. The Ski Hill Lodge continues to be one of JanesLodges guests favorite residences to visit when they come to Breckenridge!! Convenient location at 101 Christie Lane.... The Shuttle is just 200 yards away; and the pedestrian path in front will allow you to stroll right in to town (1/2 mile). The lodge sits on the ski area (west)side with full on views of Downtown Breckenridge! Lots of bedrooms at this lodge.... so it's great for corporate retreats, family reunions, lots of couples..... There is one large Gathering Area with a wood burning fireplace; awesome views and plenty of seating for fireside chats, game playing, and movie watching..... Or head on up to the Bonus Room and watch the large flat screen or build a great puzzle..... RELAX in the hot tub on the back deck that overlooks the entire town of Breckenridge! Still not sleepy?.. Shoot a game of pool or enjoy a piece of pie hot from the oven from the large kitchen on the grand level.... Enjoy a nightcap while you read in the quiet room before you turn in for the night.... There are 9 bedrooms and an additional Bonus Room to choose from! Great views of downtown and Baldy Mountain. Spans the entire back of the house!